1. Mafia 2 is a more mature game, more realistic. 2. The story is: you are Vito, son of imigrant, poor, and he makes various little crimes, like steal things with is friend Joe, over the time he gets caught, and he has the option to go to 2nd world war, or jail, we chooses to go to war, the game begins in end of that conflict, when vito returns he and joe begins his carrier in the COSA NOSTRA, but the motivations of both are different: Joe wants is crazy about being an gangster, and likes the lifesytle of gangster, Vito is looking for a better life, more reserved character, wants to escape the bad and poor life. this is not a game about gangsters is about this two characters and his journey on being "made man", is about their envolvement on the "family", and the dark side of it. 3. The realism is something really important to 2k Czech, the graphics are simply amazing, the engine is in-house, the screens speak for themself but this are not enough you need to play the game to see this amazing everivoment. 4. The destrution of the cars and physics are simply amazing, they showed us a demostration in game, beginning with a simply touch on the car, to show us this system, this scrashed the car painting. then they stealed a new car, and start shooting the tires, if you shoot in the direction of a lock, after two three shots, the door opens, they fired a few shots and the car exploded, and flame all over the car, then the tires exploded. 5. The speed limits are there, but this time you wont get a ticked that hard, you need to make some bad things to get a ticket, the police can ticket and arrest the AI. 6. All cars have full tank of gasoline, but after a long drive you will need to go to a gasoline station, there will be some missions where they will use this, you can go to a wash station and clean your car, the carjacking wont be that easy = mafia one, the police will notice the breaked glace and will be warned, its more secure to unlock the car, then breaking the glace to enter the car. 7. You can change clothes and eat, changing clothes its nice to escape police, and drinking coffee makes you stronger. 8. The city is called empire city, based on NY, SAN FRANSICO, in years 50, is the double of mafia one, they created various inside buildings, like houses, restaurants, stores, etc, the JOE APARTAMENT, is really like the house of an single guy, clothes on floor, unclenead dishes, you can turn the water on and off, light on and off, if you look outside you see the city, and cars, theres no loading in game, only to enter the game, or only one loading. 11. The main theme of the game is the story and action, you can listen about some news about some things you were involved, in the radio. 12. The soul of the mafia one is there, the action scenes, everything. 14. When you are in cover mode, the camera makes a zoom next to your shoulder, you can alternate between the right and left shoulder, for better viewing. 15. There are two principal indicatores in-game, one is the "warning of police" and the other "nivel of respect in the family", this can change if you shoot inocente people. the car, you can activate a speed limit, you can catch a taxi or a bus. 17. First mission will probably take place during the World War II, as the second one is Vito returning from it. 2K Czech doesn't say anything about the 1st mission though, as they want to maintain the element of surprise. 18. 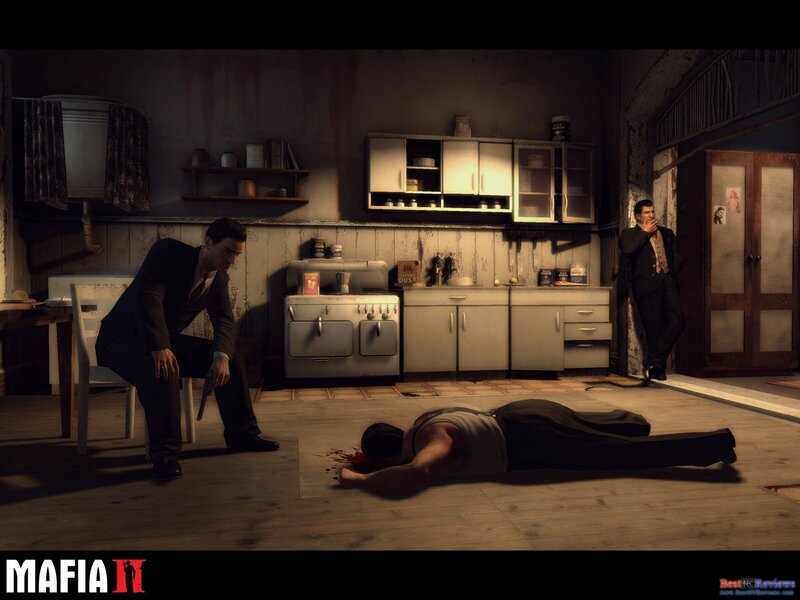 The game will be divided into 3 parts- in the first one you'll try to get into Mafia as you and Joe think that it is a good job to get, in the second one you'll choose one of the three mafias, each one you'll choose will give you a different ending and storyline in the third part. 19. You'll never be a Don, in fact you will stay as normal gangster in your chosen mafia, though you will take part in most important missions. 21. One pedestrian was created in 3-4 weeks. 22. You'll have around 50 cars from early 50's, you can open the trunk and the hood, a lot of things are animated (the engine for example). 24. The city is based on New York, it will have two important objects, one is similar to Brooklyn Bridge, and one resembling Empire State Building. Pavel Cizek, the guy who's behind projecting the city adds with smile, that maybe they'll name it as "Empire City Building". 25. You can destroy windows in the shops, you can go up the fire escape too. You can jump over the fence. In the night 2K Czech created a system which lights lights in the buildings in random order. 26. The shops will not be in a very good state, in fact they will be pretty destroyed and not in a good state, as resemblance to 50's. 27. You can buy and change clothes to lose the cops. 28. Cutscenes are said to be like in Bioshock. 29. People on the street will sit on benches, buy hamburgers and buy clothes. You can see them trying the clothes on and then buying them. 30. Martin Brandstatter, the programist, says that the PC market is their target. He says that PC version looks a lot better then in next-gen consoles, graphics are sharper and is more detailed. 31. Though the PC market is 2K Czech's main target, the consoles won't be forgotten. They have auto-aiming system that you can adapt to with ease. 32. They created a few animations for one weapon. For example- if you take a bottle, the first thing you do is hit someone from down to up, but after it brakes, you are more likely to stab with it. 33. The game will be linear like the first Mafia, and if nothing changes it will include around 18 missions. The game should be released in 2009.